One of the landmarks left by British administration; built in memory of Mr. Ribbon a British Administrator. The building was built in the early 1900s and has been aptly named after Lord Ripon who can be considered as the father of local self government. 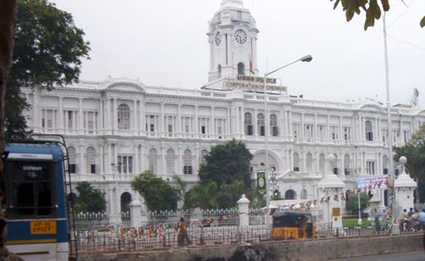 It now houses the offices of Chennai Municipal Corporation. 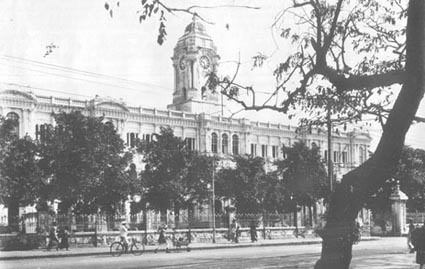 The Ripon Building stands tall proudly in its original on the West of the Central Station of Chennai .The magnificence of the building has not been altered with time. The building has been constructed by four expatriate engineers; Brick and lime Mortar constitutes ,have been used in the construction of the building. Marble has been used to lay the ground floor. An important feature of the Ripon building is its chiming clock which is set up in the terrace. This clock is manually wound every day. A total of 4 bells have been placed here.